I say ‘my new take on…’, as since having my baby boy, my desk/work situation has slightly changed and there’s not been much dance floor action for myself as of late (understatement of the year!). However this week and next, with both families around to help out, Sam and I have planned a few dinners and catch up with friends, and I can’t wait to do my hair, my make-up, and most importantly, get dressed up! Again, my version of ‘dressed up’ is never over-the-top glam, which I’m sure most of you have noticed already. 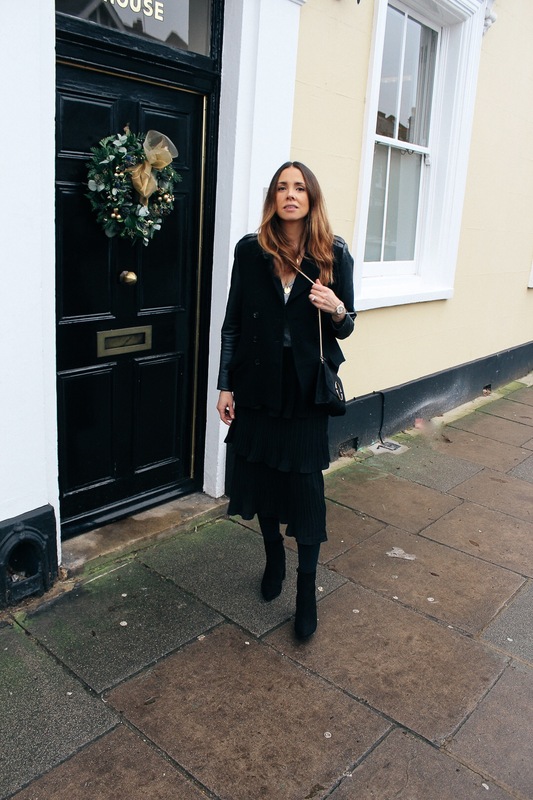 I seldom wear dresses and sky-high heels, particularly now that I’m a new mummy; there’s definetly more of a need for comfort – especially as I’m not used to wearing sky high heels any longer. 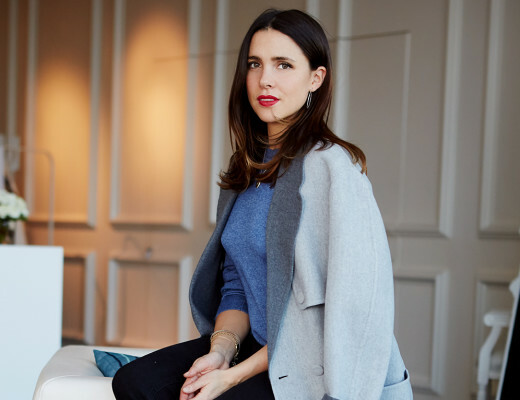 Generally, I have a much more relaxed take on dressing up, which is both quick and easy to achieve – as I’m sure many fellow baby mama’s will agree on! So now that the party season is around the corner, the first thing to identify, are real key wardrobe essentials, which fit within the above dressing criteria’s. First thing’s first is the footwear, something I always tend to work my outfit around. I recently came across Shoeaholics, an amazing online outlet for shoes and bags with up to 70% off, and found some amazing bits. 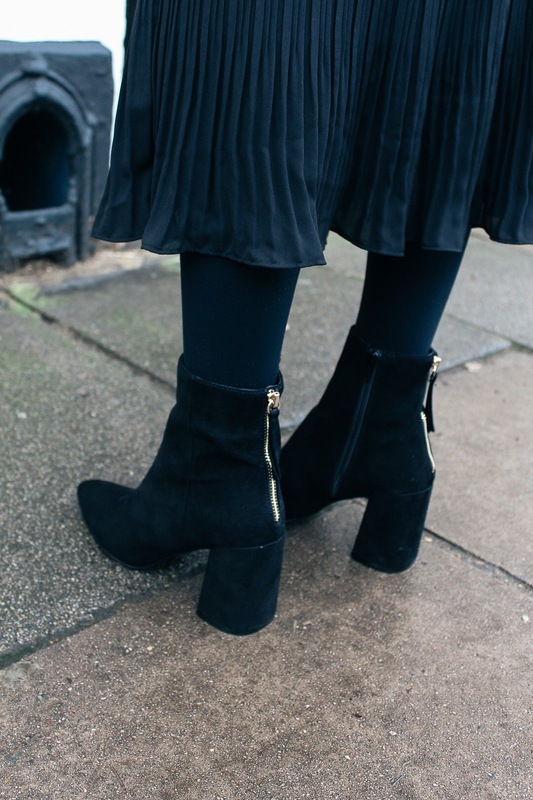 As skinny high heels are out of the question at the moment (and it’s pretty chilly out there), I tend to always opt for black booties during the winter season. Not only do they still give you that much needed height and elegance: they also tend to be way more comfortable and easy to wear – which is definite bonus if you’re planning a long night on the dance floor (although I am not quite sure I ready for that, just yet!). My chosen footwear for the coming weeks of festivities, are these black suede boots. 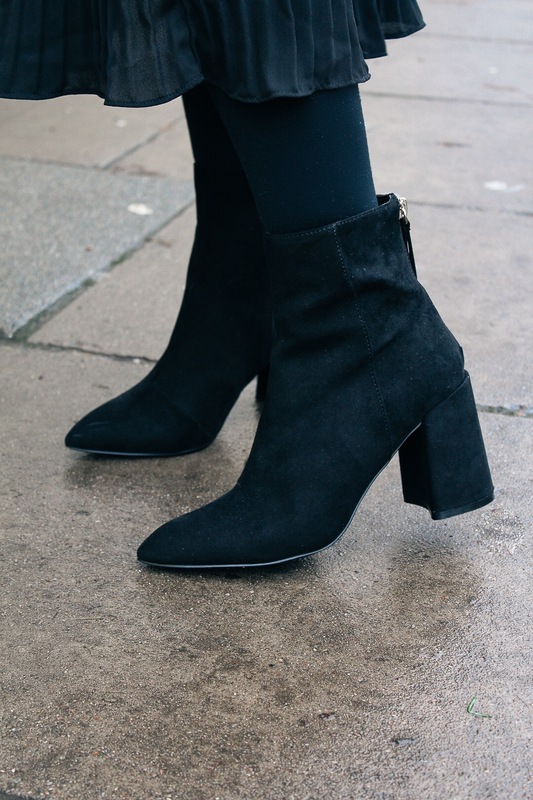 Not only are they super comfortable, with the chunky heel; they have a really good heel height, with a super flattering pointed toe, which helps elongate and lengthen your legs (an added bonus that they’re only £79 – such a good investment). Another key accessory, is your bag, which in my case is either a simple (and easy) cross-body style, or a clutch bag. This minimal style in black suede and silver detailing from Miss KG (similar here), is simple, yet sophisticated and elegant (and crucially, goes with just about any outfit). 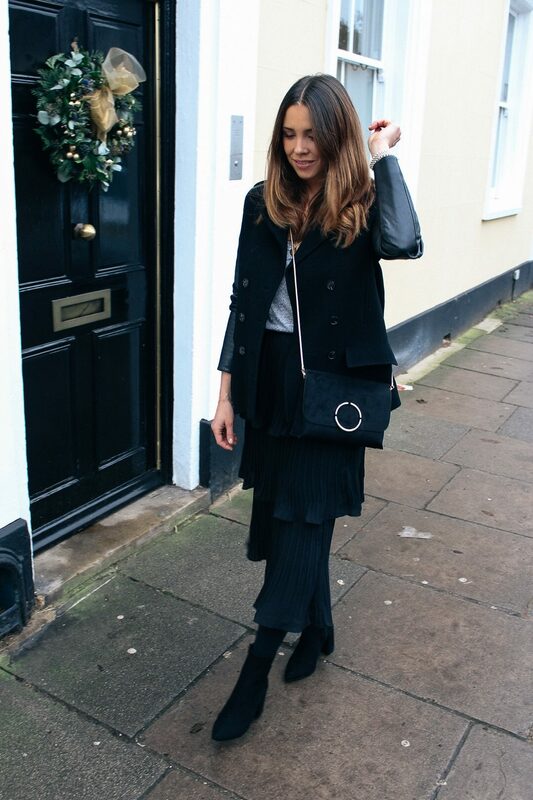 I styled up my booties and bag together with a look I feel both super relaxed and easy in, as well as sophisticated enough for a night out – with a frilly black midi skirt, simple grey tee, together with a slimline winter coat. Wishing you all a fun and festive Christmas season! Created in collaboration with Shoeaholics. All words, opinions, styling & creative direction are, as always, my own.